In which our walker admires a friendly church, is invited to picnic with the Quakers, toot-toots on a steam train and fights the throngs at an old abbey. Prior to this trip if you’d asked me about Ilkley I would have said don’t go on the moor without your hat. If you’d really pushed me, I would have proclaimed that Yorkshire Television used the fabled folk song (On Ilkley Moor Baht’at) as its jingle until someone pen pusher in London decided that it would be far nicer if everyone called the third channel “ITV1” instead. But I wouldn’t have told you that unless you’d really pushed me. Now, having been there and you’d asked me, I would have said it’s an old but interesting looking town with a train line which goes to Leeds or Bradford, has lots of shops, a love of misleading maps and some very loud and gobby people wandering around on a Saturday night. Oh and it’s all but deserted and (strangely) very clean on a Sunday morning. After a rather interrupted nights sleep involving one or more of the aforementioned qualities (what do you mean you didn’t read the introduction?) I dragged myself out of bed, dropped my room key in the box provided for such things and headed out of the pub’s back door into the sun and to the nearby Co-op for some breakfast supplies. Given it wasn’t yet eight on a Sunday morning (well if you read introductions, then you have to be prepared for them to be contradicted by the main narrative for the purposes of comedy) the store was pretty busy as I shoved breakfast, lunch and mid-afternoon snack in front of the friendly man at the checkout and headed on my way. In a fit of uselessness my guide book proclaimed that the Dales Way started at “the old Bridge spanning the River Wharfe” without actually saying where such a place may be found. Looking at the laughably small OS map fragment in the book, it looked like the river was near the railway station so I headed that way, spotting a helpful town map placed with a prime view of M&Co’s lingerie window display. The hill got higher and higher and I stopped at a windy pavilion surrounded by fag butts and Stella bottle tops and ate my breakfast whilst perusing the map in the book one more time as clearly this made no sense at all. It was too early in the morning for this kind of madness. I was right next to what looked like moorland which was clearly not a river. Dragging out my compass, it dutifully revealed that the town centre map had been angled incorrectly. What it said was south and what my compass said were two completely different things. Sighing heavily, I walked back down hill, back past the Co-op, back past the pub and then kept on going down hill until I found a large and rather obvious ribbon of blue flowing at the bottom of the town. Ten minutes later, or an hour after I’d left my hotel room and five minutes in actual distance from their back door, I found the start of the Dales Way. There was a sign and everything. One merry jig danced in celebration and I was finally on my way. For much of the first three days I’d be walking in the company of the River Wharfe, a gentle, ambling and clean river which glistened brightly in the morning sun. And in the afternoon sun too. 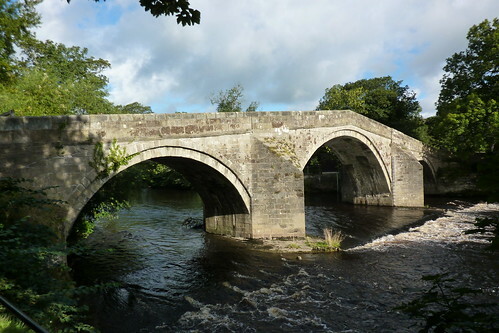 Having finally escaped Ilkley, the Dales Way took me enthusiastically through the farmland and old mill villages of Wharfedale, and by the time I’d reached Addingham three miles later, I was firmly in my stride. It being a Sunday morning, the bells of St Peter’s Church were merrily ringing and parishioners making their way in as I took a detour through the churchyard to admire the diminutive building with its distinctive blue faced clock. The church had helpfully installed two well designed information panels to tell visitors some history of the church and the area. Did you know it sheltered Archbishop Wulfhere of York between 854AD and 900AD whilst the Vikings rampaged through the countryside for example? Did you even know who Archbishop Wulfhere of York was? Did you even care? I did as I’d read it in my guide book, but it was still a lovely touch. 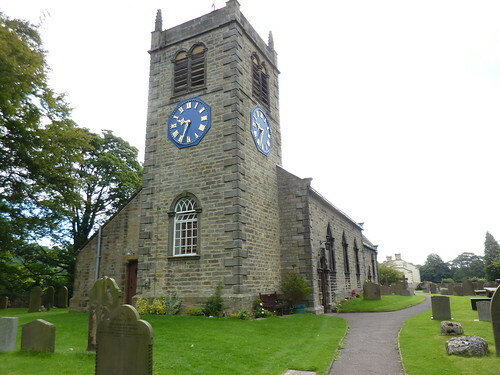 I gave the panels an appreciative nod, admired the shade of blue used on the church clock face (“Potts’ Blue” after William Potts and Sons of Leeds whose blue faced clocks became their speciality after they discovered that gold lettering is easier to read on blue rather than black) and headed up through Addingham Village. Yet more churchgoers passed me by, each with a cheery “Good morning” emanating from their lips. The red cheeked vicar seemed in an especially happy mood that lovely morning as he headed off to preach the good word from his pulpit. Cows with a stalking tendency were thankfully absent from the rest of the days travels and I left them behind and walked behind an unassuming stone building. A sign proclaimed I should pop round the front of it, and never being one to ignore a sign, I did just that. 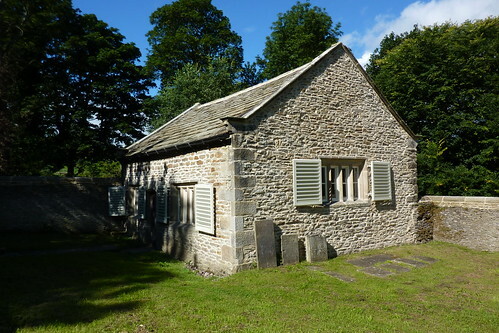 The building was Fairfield Friends Meeting House, one of the earliest Quaker meeting houses. Not used for that purpose for over 150 years, it’s now owned by the Historic Chapels Trust and open to the public. Inside I found a simple building with a few rows of seats and a raised row for the elders – an early practice that has been long abandoned. Another sign invited visitors to picnic in the grounds, which was such a lovely and friendly invitation that I felt doubly inclined to leave a generous donation in the box and start munching my sandwiches even though it was only 10:45 and I wasn’t hungry. Instead I headed on, with the Dales Way taking me alongside, and eventually on, a busy road before depositing me at Bolton Bridge. Whilst planning my trip I’d concocted a plan which I now quickly put in to action. 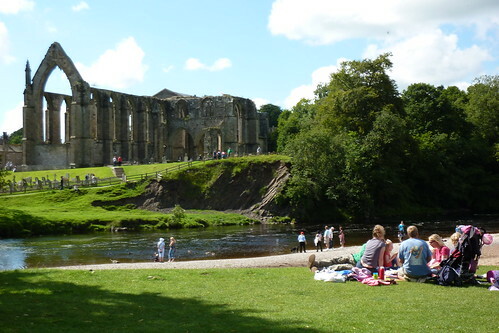 My guidebook made no mention of it, however my OS map proclaimed that down a short track I’d find the Embsey and Bolton Abbey Steam Railway. And if there’s nothing I like more, it’s a steam railway. Every walking holiday should include one and I quickly took a detour down a bridleway that had clearly once been the main road (the cat’s eyes and road markings gave the game away, as well as the pavement which everyone seemed to prefer to use rather than the old road.) Right on cue, as I entered fields and passed through a subway, I heard the tell-tale whistle of a steam engine filling the area. Following the wrong sign post, I found myself deposited at the wrong end of Bolton Bridge station’s car park next to a sign marked “Bolton Abbey Station Permissive Path”. Maybe I should have twigged from the fact that it was on the opposite side of the tracks to the station, however I just assumed it made a lazy loop around the premises and so followed it along just as a train pulled in, and promptly found myself way beyond the station at a dead end surrounded by signs of the “PRIVATE” and “KEEP OUT” variety. Clearly this was a path for viewing, not boarding the carriages and with a heavy sigh I retraced my steps and walked through the car park to the station as I should have done in the first place. Thankfully I hadn’t missed the next train which wasn’t due out for another twenty minutes and which was grandly described as the “Stately Steam Special (First Class Only)”, so I waved my tenner at the ticket office and rushed out to the platform to board the “Stately Steam” which was naturally a blue diesel engine which doesn’t have quite the same impact, even if the engine type was apparently very rare. But then I didn’t have time to wait the forty minutes required until the next train arrived so I boarded a wooden carriage with a cup of a tea and a current slice, found a compartment, and waited for the off. The Stately Clearly-Not-A-Steam Special (First Class Only) was only three carriages long, and packed full of tourists who didn’t seem to care that they wouldn’t be able to get soot in their hair. Being alone I did what I always tend to do in such situations, to whit, listen in to other people’s conversations. My carriage was shared with, amongst others, a family with a three year old son who was very excited about the short trip up the line. The said family was clearly bilingual and even at that age the child was switching easily between French and English, changing randomly mid sentence as the mood took him. It was Dad who was English, whilst mum was French with the kind of French accent that would make a grown man cry “Zoot alors!” if they didn’t know French very well, or perhaps even “Ooh La La!” if they did, and fall madly in love there and then. 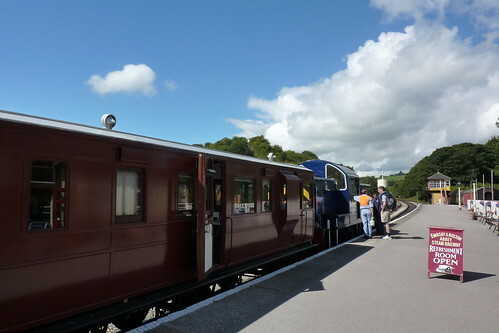 The train journey was only a quick one – a mere fifteen minutes to the other end of the line, passing a steam train en-route pulling a long rack of heaving standard class carriages. 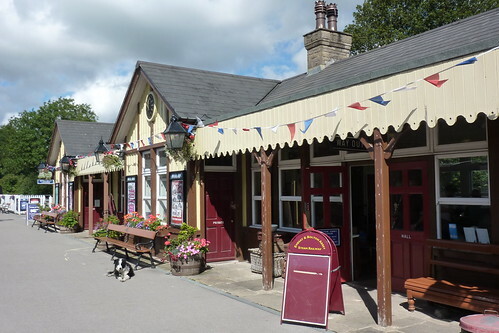 And after a twenty minute stop I took a different seat and we were off once more back to Bolton Abbey station. The French lady had gone, replaced by a two year old girl who seemed highly keen to poke her dad’s eyes out with a Thomas the Tank Engine flag at every possible opportunity. In my hour and a half away from the Dales Way, the paths had got busy. Very busy. 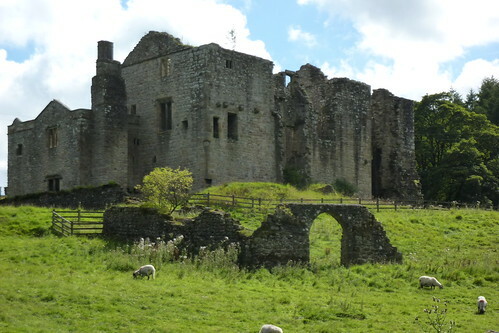 The good weather seemed to have sent everyone in the area in the direction of the ruins of Bolton Priory and the woodland around it. A set of stepping stones across the Wharfe were so popular that there was a substantial queue to get across whilst happy children splashed in the water which glistened in the sun. Walking through the woodlands, the paths were heaving with people who were taking the opportunity for a stroll. With my overflowing rucksack and hiking boots, I looked rather out of place, especially compared to one woman who was hobbling slowly down a steep path, clinging to her partner. She probably came to regret going along it in her high heel shoes. My guidebook proclaimed this to be a great section for admiring the local birdlife, however with half of Yorkshire having popped to the place for the day, few were to be seen and I crossed the river and headed in to Strid Wood seeing little wildlife. 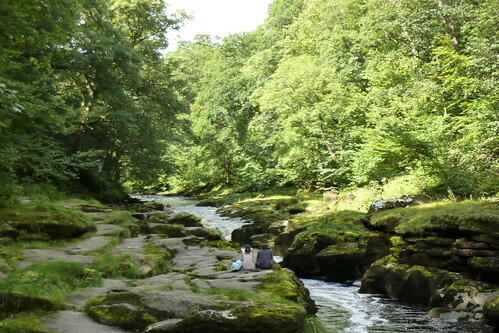 Now a Site of Special Scientific Interest, Strid Wood is home to the acid loving and rather rare Sessile Oak tree as well as 62 different kinds of birds, all of whom were hiding in the tree tops. Still I would get to see something for inside Strid Wood is Strid Gorge which sees the River Wharfe squeezed through a narrow channel of rocks. To the casual eye it looks merely like a small waterfall at the end of a narrow channel of rocks, however below the river has carved out a channel over 9m deep which is so deceptively hidden that people occasionally ignore the strongly worded warning signs and pop in for a swim before promptly drowning. For something so dangerous, it looked amazingly tame, although not tame enough for me not to keep a respectful distance from the edge as I gingerly walked over the rough rocks on the side of the gorge to get a better look. If I’d had any doubts about the quality of my guide book when it remained totally oblivious to the delights of a steam railway, I really raised my eyes when a grand aqueduct carrying water to Bradford which had turrets and everything got barely a cursory mention. The book instead favoured the far smaller, blander Bardon Bridge a mile down the path which it spent a multitude of paragraphs raving about. On the other hand, the car park next to the bridge had an ice cream van and it being a hot day I eagerly took ownership of a rapidly demolished Cider Refresher lolly. Nearby was Bardon Tower, the ruins of which nestle in woods high up above the river. It’s not actually on the Dales Way however I took the detour up the road to see it and dutifully poked around its square base. Although not for very long; the tower had no information panels, nor the chance to go inside. The only sign spent most of its time grumpily moaning that the owners had to maintain it without any help from the Government, and it all seemed an incredibly dry and dull place. The tower gave me no incentive to care, nor any real burning desire to make me outraged at their lack of tax payers cash and whilst I didn’t quite run back to the Dales Way, I didn’t exactly linger either. The Way did at least now leave most of the tourists behind, with the path to Appletreewick and Burnsall being much quieter and kept mostly to myself. Bar a brief interlude through the attractive tree lined paths of Haugh wood, it was back along the river once more, occasionally interspersed with caravan parks and more happy tourists. The high Kail Hill rose on the other side of the river, providing the first real hint that the Dales weren’t all flat, however it disappeared as I dropped into a field car park which boldly proclaimed there was a 50p toll for pedestrians – a bit rich for a public right of way. Muttering under my breath at the audacity, the “toll collector” seemed more content to ignore me and linger down from the path so to pester some motorists instead, and at the car park entrance the situation seemed a little clearer – as well as being a car park, the field was also a bit of an impromptu picnic spot with people sat on the grass near the cars, and it was no doubt such people who were the principal revenue source. Still, arriving in a village 50p better off is not to be sniffed at and it was promptly assigned to my beer fund for later in the evening. 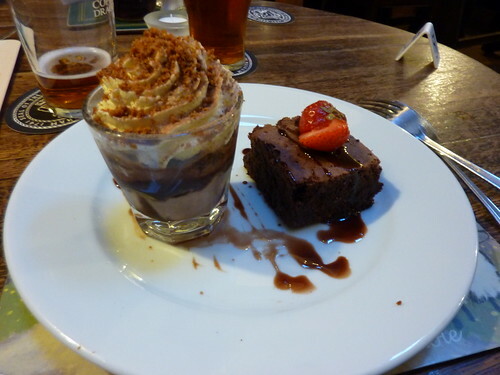 “The Red Lion is as good a place to eat as any” proclaimed the owner of my B&B, which hardly seemed a ringing endorsement, so it was with some trepidation that I entered the doorway of the only place to get food in Burnsall village. Thankfully such thoughts were soon banished by the sight of an excellent cod loin served on a bed of sautéed spinach, with tomato sauce and wild mushrooms. Such delights seemed lost on many of the clientèle on tables nearby whom were busy ordering cottage pie, mixed grills and, of course, fish and chips. It was their loss. Dessert turned out to be a bit more of a challenge. Never one to turn down a chocolate brownie, the statement that it came with “chocolate yummies” was enough to cause a puzzled look on my face. Still nothing ventured and indeed, nothing gained. Chocolate yummies turned out to be a slightly odd concoction of a glass of half frozen chocolate ice cream, with whipped cream and hazelnuts on top. Tucked away in a corner of the bar area, surrounded by fox and deer heads and other once alive creatures, I studied the concoction with some confusion before shrugging my shoulders and spending substantially more than 50p on another beer before staggering back to my B&B. First Published: 7 January 2011. Last Updated: 28 August 2015.